About Map: Map showing location of Chile in the World. 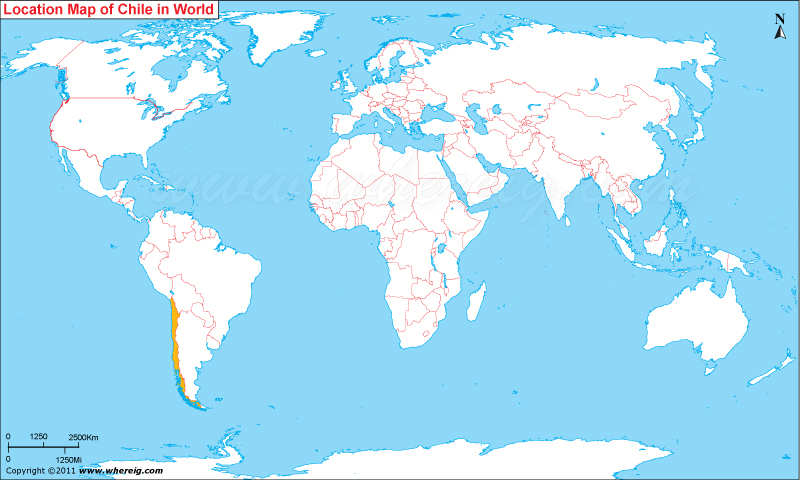 The Chile location map shows that Chile is located at the western part of South America continent. Chile map also shows that the shape of the country is very unique in the world. It has long and narrow shape similar to chilli. The country is located between the Andes Mountains from the east and Pacific Ocean from the west. However, Map of Chile also depicts that it shares its international boundaries with Peru in the north, Bolivia in the North West, and Argentina from throughout the east. Chile is only second country that does not share its international boundary with Brazil; another one is Ecuador. Besides, the mainland, Chile also includes some of the islands such as Juan Fernandez, Salas y Gomez, Desventuradas and Easter Island lying in the Pacific Ocean. Due to latitudinal length the climate of the country also varies according to the Latitudes. So, it has wide range of climates such as in north Chile, there is world's driest desert- the Atacama, in the centre part country has Mediterranean climate, and in the south it has rainy temperate climate. However, the Atacama Desert is conducive for Chile because it contains reserves of minerals especially, copper. At present, Chile;s financial condition and infrastructure are quite good in South America. It has leading role and position among Latin American nations in human development, competitiveness, per capita income, globalization, and economic freedom. It also keeps high rank regionally in terms of freedom of the press and democratic development. The political system in the country is quite stable. After 2010, Chile became the first South American country who joined the OECD. Besides, Chile is a founding member of the United Nations as well as the Union of South American Nations.